Welcome to the July 2017 Pals Blog Hop! I decided to show off the Coffee Break Suite using the Coffee Cafe Stamp Set, Coffee Cups Framelits Dies and the Coordinating Coffee Break Designer Series Paper. This card is similar to one I have created in the past, which you can see here: Coffee Cafe Bundle Is Great for Friends! I love square cards and use them often as my template to create. They are easy to assemble, add layers and fit an abundance of embellishments on. Since I think Coffee Cafe gives a “gather with friends” feel, I like to incorporate two cups on my creation…because one cup would just feel lonely, right? The color combination of this suite is fabulous! The colors are Early Espresso, Garden Green, Pear Pizzazz, Soft Sky, Soft Suede and Whisper White. The Mini Chevron Ribbon I used on this card is actually Old Olive, I didn’t realize I grabbed the wrong “family” of ribbon when I was creating. It still works, the colors are close enough (at least to my eyes). If I had a chance to re-do, I would use the Soft Sky 3/8″ Classic Weave Ribbon which is part of the Coffee Break Suite. Card Base is Whisper White Thick Cardstock cut to 5.5 in x 11 in and scored / folded at 5.5 in to make a square card. The Wood Grain Look DSP from the Coffee Break Pack is the 2nd layer of the card and is cut to 5.25 in x 5.25 in and adhered to the card base with Stampin’ Dimensionals to make it pop-up off the page. A piece of Whisper White cardstock was cut to 5 in x 5 in. I wrapped the Old Olive 3/8 in Mini Chevron Ribbon and secured it with a bow then adhered it to the DSP with Fast Fuse Adhesive. The two small coffee cups were cut with quickly cropped from the piece of DSP with the coordinating dies and big shot. I used the chevron and dot paper with the cup dies (small and large shown on left in photo below). The coffee wraps were also cropped with the die shown on the far right, top row. I stamped the Life Happens Sentiment in Early Espresso on the scrap piece of Whisper White Thick Cardstock I had from cutting the card to size. I cut this out with the coordinating die (same as wrap stated above) and then I slightly trimmed it with a Paper Snips so that you could see the Woodgrain DSP behind it. The Thanks a Latte Sentiment and the Coffee Beans were done the same way and cropped with its coordinating die. I stamped the latte cover and whipped topping (inside the cover) on the scrap piece of Thick Whisper White with Smoky Slate Classic Ink that I stamped first on my Grid Paper and then onto the cardstock to make it look light like a shadow. As with most of my creations, most items on my card are adhered with Stampin’ Dimensionals. I finished off the card with a bow made of Linen Thread and a few different coordinating color Enamel Shaped Hearts. 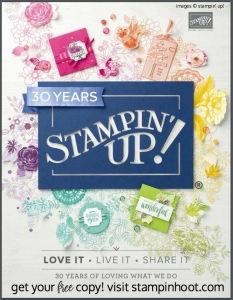 Stesha Bloodhart at Stampin’ Hoot! —- YOU ARE HERE! Great card Stesha and I love your photography and graphics! Truly awesome! Thank you Beth! I have to hop along to all and check out the great work by the Pals! This might be my absolutely favorite design paper of all time. I am.in love with this coffee suite and how you showcase it. Thanks for sharing ? Thank you Jen! I appreciate the sweet comment! Stesha–this is the best card I’ve seen using this bundle. I think the Old Olive ribbon really contributes to the overall design… it makes everything else pop. A big WOW! Thank you Debi! You have made my day! What a great showcase of Designer Series Paper!Love the ribbon touches too! Beautiful card! Thank you Jeanie! I appreciate you taking the time to view my blog and making the super sweet comment! Adorable. I love your style Stesha and your photos are fabulous. Thank you Michelle! I love every aspect of this gig and couldn’t be having more fun! Great card Stesha! And, I like your choice of ribbon!